These are 6 pairs of new Teva Olowahu flips flops. 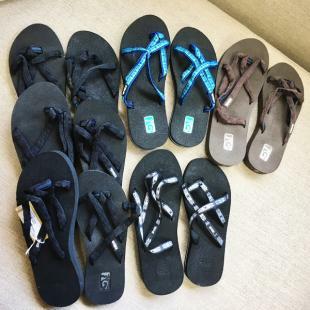 3 pair are a footbed of black with black straps, 1 pair are a footbed of black with multi-blue straps, 1 pair are a footbed of black with multi-grey straps and the other pair is a footbed of brown with brown straps. Sizes are right foot 6 and left foot 8. These are the most comfortable and long lasting flips flops you will ever wear.